We’d love your help. Let us know what’s wrong with this preview of Shelter by Jung Yun. A few miles away, his parents, Jin and Mae, live i Why should a man care for his parents when they failed to take care of him as a child? Carrie The location is near Boston. I enjoyed the writing a lot. I thought it was well done, easy to read, and kept my interest. The main character was the most pitiful excuse for a main character I have ever seen. He is a stupid, whiny, inconsiderate, good-for-nothing loser. Even when I thought the author was trying to make me "understand his pain" or "realize he couldn't help it", I just wanted him to sack up, grow a pair, take some responsibility, treat those around him with respect, and stop being a big, whiny bab I enjoyed the writing a lot. I thought it was well done, easy to read, and kept my interest. The main character was the most pitiful excuse for a main character I have ever seen. He is a stupid, whiny, inconsiderate, good-for-nothing loser. Even when I thought the author was trying to make me "understand his pain" or "realize he couldn't help it", I just wanted him to sack up, grow a pair, take some responsibility, treat those around him with respect, and stop being a big, whiny baby with no common sense. As you can tell, my feelings are strong here, and they are not good. Damn! I almost owed the library a new book because I was close to ripping pages out toward the end! Wow.... Now I understand why "Shelter" was a contender for best fiction of 2016. Where does one begin to write a review? Immediately I was pulled in. Within pages we are involved with the struggles a couple is facing. Kyung Cho is Korean born.... Gillian is Irish, but born in America. They are living in the states with their 4 year old son, Ethan. The couple has financial problems and has invited a realtor over to discuss plans to either sell or rent their house. Their final plan is to rent their Wow.... Now I understand why "Shelter" was a contender for best fiction of 2016. Their final plan is to rent their home for a year - and move in with Kyung's parents who own a six-bedroom home -in Marlboro Heights, not too far from where they live now, ..... it's the best neighborhood in town. We first meet Kyung's mother, Mae, traumatized. We get pulled into her urgent need - at first shocking - sad - but unclear of the full story. One-by one...characters come into focus -- tragedy seems almost a disease at the rate horrific facts unfold. We soon meet Jin, Mae's husband, and Kyung's father. As we get more background information-- we learn of the tension in the household that Kyung grew up in as a child. As an immigrant from Korea, Jin has succeeded in America. He's an engineering professor with a side business that proved to be financially profitable. Given Kyung isn't even close on the scale of being considered successful himself fulfilling the American dream - we see this man begin to break down inside him. He's a bitter self-centered man. When Kyung sees his own father and son enjoying each other --even looking as though they belong together -- are close-- Kyung thinks his father is ruining everything in his life. He has a rage inside him that's so desperate and helpless. This family faces past and present domestic violence, crime, rage, grief, tribal-struggles, marriage struggles, parenting issues and conflicts, the cost of secrets, physical scars, psychological scars, , spiritual and cultural challenges, and personal self worth. While this is a very sad story, the natural innate writing is intuitive and beautiful. The characters are very well developed. The story and relationships are complex... the social issues and racism also complex. Kyung Cho is Korean born but is now living in America with his wife Gillian and their four-year-old son. He’s well educated and works as a tenure-track professor at the local university. But he and his wife have over-stretched themselves and their financial situation is perilous. They have next to no savings, a sizable mortgage on their neglected house and a collection of credit cards, all of which are maxed out. On top of this, Kyung is not a happy man. Nothing about his life seems a good fit: Kyung Cho is Korean born but is now living in America with his wife Gillian and their four-year-old son. He’s well educated and works as a tenure-track professor at the local university. But he and his wife have over-stretched themselves and their financial situation is perilous. They have next to no savings, a sizable mortgage on their neglected house and a collection of credit cards, all of which are maxed out. On top of this, Kyung is not a happy man. Nothing about his life seems a good fit: he’s got an unsatisfying marriage, a son who he’s struggling to work out how to be a good father to and a career that just doesn’t feel like the one he’d envisaged for himself. His father is a huge figure in his life. He brought Kyung to America as a young boy, to take up a professorship in their new country. He made it big through his ability to register patents for his ideas that now bring in bucket loads of money. He looms large over his son at the university too, and is probably the primary reason for him being offered a position there in the first place. Kyung’s mother struggled to adapt to America. She didn’t find it easy to learn the new language and her lack of ability to drive meant she has had limited social contact. She does, however, take pride in their huge house, in the most prestigious neighbourhood – just up the hill from Kyung. On one fateful day, just as the realtor is sizing up his house, Kyung’s mother comes into view through the window. She is traumatised and naked. From this point we begin to understand more about Kyung’s relationship with his parents and the collection of behavioural, social and cultural issues that have combined to largely estrange him from them. But a cataclysmic event has unfolded and it will force Kyung to confront his relationship with his parents, his wife, his son and his job. However, the second half blew me away. The whole thing speeds up and new factors are introduced. I pretty much gobbled up the rest in one sitting! It’s powerful stuff and it’s all very well told. There’s loads here about relationships and change and how we deal with difficult situations that crop up in all of our lives (ok, maybe not quite like this one!). But at the heart of it there’s a good story. I enjoyed it immensely. Note - there are some difficult and graphic scenes here that may not be everyone’s cup of tea, but they do fit with the context of the story and should, in my view, be seen in that light. 3.5 Shelter is one of those words that can hold a different meaning for different people. For me, my shelter is my home, a place of safety, comfort, and even peace now that my children are grown and no, longer living here. But what if your home was not a place of safety? How do you move on? Shelter can even represent a place in your mind, a place where you put those memories, the things that happened so that you can put on a pretend face in public, allowing you to act somewhat normally. Houses a 3.5 Shelter is one of those words that can hold a different meaning for different people. For me, my shelter is my home, a place of safety, comfort, and even peace now that my children are grown and no, longer living here. But what if your home was not a place of safety? How do you move on? Shelter can even represent a place in your mind, a place where you put those memories, the things that happened so that you can put on a pretend face in public, allowing you to act somewhat normally. Houses and shelters play very important parts in this novel. The plot, the writing and the pace of this novel moved very fluidly. I found the first part very intense, a horrible crime committed that sets the stage for what follows. Never felt I knew the characters very well, at least not until the end when we get an insight into why this was. I do think this was partly because some of the characters did not even know themselves, but non the less , I often felt at a distance from them. Secrets, the secrets kept coming and the effects of these secrets. Marriage, abuse, the difficult lives of immigrants, are all themes. But the big question I think is, when do we stop blaming the past for our present? When do we take responsibility for our own actions, our own person? Quite a thought provoking read. SHELTER is an engrossing book from the very first page to the last. It starts with a horrific crime and continues with the secrets unleashed in it's aftermath. I can't say I actually enjoyed the book, there is a terrifying realism to the story and that story is such a sad and ugly one. SHELTER explores many different themes regarding culture, family duty, domestic violence and immigrant discrimination. SHELTER is an ambitious combination of books like House of Sand and Fog, The Book of Unknown Americans, Everything I Never Told You and The Tortilla Curtain. If you have read these, you know that the stories are difficult to absorb and you don't necessarily feel great afterwards. But, in the end, they are eye-opening and important. Plus, wouldn't you rather know than not know? I would. It's easy to stick your head in the sand, but let's don't take the easy path. Realization leads to compassion and understanding. Understanding leads to growth and reading this book is a great place to start. I couldn't give SHELTER 5 stars, though it is definitely a high 4! The writing was a bit clunky in places and it just doesn't flow like a Celeste Ng novel. I think we've all had experiences of finding it easier to review a book we didn't like than a book we really liked. When a novel doesn't work for us, it's usually fairly obvious which parts are malfunctioning. But when a novel is working, there's something almost alchemical about it: All of the parts lock together seamlessly, and it's next to impossible to single out elements particularly worthy of praise. Shelter drew me in immediately, but why? I could say it's the characters, none of whom were I think we've all had experiences of finding it easier to review a book we didn't like than a book we really liked. When a novel doesn't work for us, it's usually fairly obvious which parts are malfunctioning. But when a novel is working, there's something almost alchemical about it: All of the parts lock together seamlessly, and it's next to impossible to single out elements particularly worthy of praise. Shelter drew me in immediately, but why? I could say it's the characters, none of whom were particularly likable but all of whom were definitely human and well-developed and somehow earned my sympathy by the end. I could say it's the writing, intelligent, flawless even, and fully capable of staying out of its own way. I could say it's the plot, which managed to keep me guessing without being implausible. Ultimately it's all of these things, but something else that's impossible to account for. Whenever I started reading this, I didn't want to stop. I was completely absorbed the entire time. The end came neither too soon nor too late but at precise moment when it should have. I marveled the entire time that this was a first novel. It's not a showy book and it may not win any prizes, and I suppose it's possible that other readers may find elements that didn't work for them, but there's no doubt that Shelter really worked for me. I picked up Shelter after reading a few of the reviews here, and I’m so glad I listened to my GR’s friends! What a rare book! On the surface, Kyung Cho has a pretty good life. Sure he’s deeply in debt and his marriage isn’t perfect, but he has a decent job at a liberal arts college, a nice son, and two parents who clearly want to be closer to him. Yet Kyung is distant from everyone around him. He lives in a constant state of watchfulness and low-level anxiety, never sharing his feelings or exper I picked up Shelter after reading a few of the reviews here, and I’m so glad I listened to my GR’s friends! What a rare book! On the surface, Kyung Cho has a pretty good life. Sure he’s deeply in debt and his marriage isn’t perfect, but he has a decent job at a liberal arts college, a nice son, and two parents who clearly want to be closer to him. Yet Kyung is distant from everyone around him. He lives in a constant state of watchfulness and low-level anxiety, never sharing his feelings or experiencing real human connection. Then his parents are violently attacked, and Kyung is forced to let them stay at his home to recover. Once the family is under one roof, we begin to see how Kyung’s father and mother crippled him in different ways as a child. Over time, it's clear that he can’t really function as a parent, husband, or even an employee. To say this is a novel about the effects of child abuse would be accurate, but also hopelessly simplistic. It’s about terrible suffering and the things we do to compensate for it. It’s about being the son of Korean immigrants in America and how the two cultures are often in conflict when they live inside the same person. And it’s about obligation—what exactly do we owe our parents and our children? The writing in Shelter is unadorned, almost like a police report, and this adds to the feel of Kyung’s detachment. Yet it’s intensely, addictively, readable, so much so that I pretty much did nothing else but immerse myself in it for two days. I subtracted a star for some melodramatic business at the end that didn’t seem organic to the plot, but other than that, this is a truly excellent novel. Kyung Cho, a Korean born American is married to an Gillian an Irish-American. He has a doctorate in biology and teaches at a university. But they struggle to make ends meet, with enough debts to have him declared bankrupt. Gillian's father, Connie, is a cop, and Kyung's parents are affluent first generation immigrants to America. Gillian grew up with limited resources to succeed, while Kyung was priviliged. When a tragedy strikes, Kyung's parents is forced to move in with them and soon a drama en Kyung Cho, a Korean born American is married to an Gillian an Irish-American. He has a doctorate in biology and teaches at a university. But they struggle to make ends meet, with enough debts to have him declared bankrupt. When a tragedy strikes, Kyung's parents is forced to move in with them and soon a drama enfolds which leads to bitterness and emotional warfare. Kyung has difficulty in forgetting the past, and struggles to be the father to his own little boy, that he always wanted to be. He cannot be kind, if he did not know kindness himself as a kid. He cannot love if he wasn't loved himself. Through a chain of events, Kyung finally is forced to face his own truths and understand his parents who never shared their own troubles and suffering with anyone. Kyung will find out the hard way what family and love is all about. The events leading up to the final crescendo forced Kyung to finally open up, become connected to the people around him and trust them enough to help him get over his past. It is a powerful novel, steeped in emotional chaos, with each character being confronted with their own mistakes when the tragedy turns into disaster. It is so well written, with so much compassion and insight. Through a journey of dark events, understanding and hope triumphs, for those who were able to survive. A startling and visceral debut, Shelter will resonate with anyone who has felt the pain of family trauma. The story focuses on Kyung Cho, a young father who finds himself deep in debt. Though he has a good job at the local university, he and his wife have spent way above their means, placing them and their young son in a precarious position. Kyung refuses to ask for help from his parents, Mae and Jin, who live just a few miles away in a wealthy neighborhood. In his childhood, they treated Kyung A startling and visceral debut, Shelter will resonate with anyone who has felt the pain of family trauma. The story focuses on Kyung Cho, a young father who finds himself deep in debt. Though he has a good job at the local university, he and his wife have spent way above their means, placing them and their young son in a precarious position. Kyung refuses to ask for help from his parents, Mae and Jin, who live just a few miles away in a wealthy neighborhood. In his childhood, they treated Kyung with coldness and cruelty, so he owes them nothing now. But when a horrifying act of violence forces Mae and Jin to live with Kyung and his family, the Chos must confront the collective trauma they thought they had left behind. Jung Yun does a fantastic job writing about pain. Pain resides in every page of this book: the pain Kyung experienced as a child and how it still affects him, the pain of the brutal trauma his parents just went through in their luxury home, the pain of fighting and clawing to make it in the United States as an Asian American. Yun examines her characters' suffering with depth and complexity, never sensationalizing their struggles even when they get grotesque. She imbues Kyung, his parents, and all the other characters with complexity, drawing us in to better understand their backgrounds and motivations. I most loved how Yun gives us jagged visions of hope throughout the book. Shelter contains no easy solutions; the pain inflicted by and to the Cho family goes way too deep for any type of quick fix. Still, Yun raises ideas that we can use to better our own lives - questions about what it means to parent and to love, about how we can tackle racism and other issues of social justice instead of letting them tackle us. She gives us a lot to ponder about the Cho family and their circumstances even after the novel's conclusion. I bought this book when it first came out and forgot to re-read the synopsis before diving in just now so I wasn't wholly prepared for the darkness that laid within the pages. This is a family drama that deals with the ugly side of family and society. While I felt for Kyung and the things he went through as a child, I despised him as an adult. I know our childhood shapes us (we all have a trait that grew from a childhood event that we wish we could change), but he used this as an excuse to not t I bought this book when it first came out and forgot to re-read the synopsis before diving in just now so I wasn't wholly prepared for the darkness that laid within the pages. This is a family drama that deals with the ugly side of family and society. While I felt for Kyung and the things he went through as a child, I despised him as an adult. I know our childhood shapes us (we all have a trait that grew from a childhood event that we wish we could change), but he used this as an excuse to not take responsibility for any of his actions. "Shelter" is one hell of a debut by Jun Yun. I was hooked by the end of the first chapter. Yun's writing is so vivid. You can see and feel everything that is happening within the story/plot. Never a dull or awkward moment. I don't think I got distracted once while reading this book, which is rare for me because I get distracted very easily (I can't help it, I'm a Gemini). Her characters are intriguing, complex, and deeply-flawed. The Cho family is the most toxic family I've read in a lon INTENSE! Terrific read! I've been thinking about this one for a week and still struggle with articulation ... my notebook is full of fitful starts only to be scrapped and re-written ... over and over and over... sure sign for me of a wonderfully deep, thought provoking story. Wow what a fabulous read! Poignant but smooth, textured with jagged edges, all at the same time. Nearly a full two w Terrific read! I've been thinking about this one for a week and still struggle with articulation ... my notebook is full of fitful starts only to be scrapped and re-written ... over and over and over... sure sign for me of a wonderfully deep, thought provoking story. Wow what a fabulous read! Poignant but smooth, textured with jagged edges, all at the same time. Nearly a full two weeks after finishing this book, its resonation has been incessant yet I’ve struggled to come up with the prose to adequately describe this wonderful story. Perhaps the ceaseless reverberation in and of itself is commensurate praise for this evocative exploration of relationships on so many levels, pummeled and buffeted by the deeply held emotions of physical and psychological abuse. Have you ever nicked yourself with a razor sharp knife while preparing a meal, so engrossed in the process that at first you don’t even feel the wound? Between the mental focus of multitasking in the kitchen and the precision of the blade, it isn’t until you see the drops of blood and wonder what the heck is going on! You discover the blood source and suddenly your brain goes into overdrive, piecing things together and … reacting! I found Yug’s writing to be like that. Her style is smooth and comforting, smooth as silk and easy as a lazy summer afternoon as she led me unknowingly but very willingly into a maelstrom of sharp, angry and at times hateful emotions released after festering for decades. Piecing together the bursts of back story with the blunt force of current events had my mind screaming with reaction … in a profound and compelling way! The story centers on the life of 36 year old Kyung Cho and his relationship with his parents Jin and Mae. Kyung’s parents emigrated from Korea to the United States back in the 1970s and Jin is a very successful professor, amassing considerable wealth through patents from his work at the university. While the affluence and success at the university has provided physical comforts for the Chos, the emotional pain of the blatant, ceaseless racism Jin endured when he first joined the university faculty and his uncertainties and regrets about his marriage created a hostile environment of abuse that cascaded from spouse to spouse to son. Only the physical presence of Kyung as he grew from child to teenager ended the cycle of violence and abuse. That was eighteen years ago, eighteen years of slow, simmering rage. Kyung met Gillian McFadden during grad school. Married for five years, with their young son Ethan, life has been hard. Between heavy school debts and an upside-down mortgage that is fathoms underwater, Kyung is under constant financial and emotional stress despite his decent salary as a biology professor. Kyung’s mistakes have been many with no relief in sight. Hopelessness, regret and despair are the chips that sit on his shoulders. Despite the constant struggle to just get by, he refuses to reach out to his parents who live in the affluent section of town just a short distance from their home. The violence and sexual assaults during the home invasion of the residence of Mae and Jin Cho force the families together under the same roof. Deeply held anger and frustration and long ago buried secrets, coupled with the culture clash of the homeland Korean values of Mae and Jin and the American values of Kyung’s family, unleash some explosively powerful emotions that result in tragic, unintended consequences. The story is tragic but profound, exploring emotions that in some shape or form many of us experience in our relationships with our parents, relationships that change over time with age and perspective. There is violence without graphic details. There is love without condition. There is forgiveness that is tender and true. This is a book I’ll purchase for my personal collection and read over and over again. Shelter is a sparkling literary gem. I highly recommend it! Upgrading this book to 4.5-5 stars. I think about this every day and it has changed the way I reflect about my choices as an Asian-American. Jung Yun is brilliant. An expression of thanks is extended to Edelweiss and Picador Publishing and the Author, Jung Yun for providing Shelter in e-galley format for my review. For a little over two days I was wrapped up in the world of Kyung and his family. Rather than reading quickly and turning the pages rapidly Shelter is the kind of book I like to slow it down and contemplate the story. Just what is happening here? Who are these people and what baggage have they brought to this place in time that makes them who they are today? Let me back up a bit. A brief summary finds Kyung Cho and his wife, Gillian, in over their heads financially. Things are so bad that they are facing the reality that their home must be sold. As the realtor, Gertie, delivers the stark news that the sale of their house may not bail them out, she becomes mesmerized by something in their backyard. All three can’t believe their eyes. It’s a woman, a naked woman at that, and the real shocker is that it appears to be Kyung’s mother, Mae. On reaching her, she is bruised, and dirty and is begging for help. Determining just what happened is just part of the story. Some reviewers will choose to tell you a great deal more than I will. Know that this is a story of a very dysfunctional family and it is haunting. Kyung and his family immigrated from Korea to America when he was a young boy. The author, Jung Yun is quick to point out that Koreans are not the sum of her characters but I feel culture definitely plays a role in who these characters are, how they live and their interrelationships in family. However, they need not be Korean for this familial hierarchy to exist. They could be any first or second-generation family bringing their cultural mores to America and adapting to life here. This will all make sense when you read the book. Shelter is a story immersed with secrets, guilt, duty, abuse, love and hate and explores how all of these define Kyung and his family and the meaning of home. Shelter has the desperate tone of another favorite book of mine, The House of Sand and Fog, and may appeal to those who found that book a compelling read. Shelter is a stunning, intricately woven, debut. It begs reflection and discussion. This was entertaining, suspenseful and in parts relatable to my own situation, but as a whole it was just ok. The writing was too simple for my taste and the cheesy dialogue at times felt like a soap opera. But the real problem was the ending: It was implausible, cringe-worthy and even somewhat insulting. **I received this book from the publisher through the Goodreads Giveaways program. I voted for this in the 2016 Goodreads choice awards because it was the most interesting novel I'd read among the choices. It wasn't an easy read. I disliked everyone except Ethan Cho, the four-year-old, and given time I'm sure I'd've disliked him too. What price family? I didn't have a close or happy family. My own parents weren't like the Chos, they were chaotic rather than cruel and cold. But what made the book interesting for me is the way Kyung tries to stop the vicious cycle of chill and distance, and fails again and again. His wife is just as guilty of emotional dysfunction as he is. When this screwed-up couple is, in simple human decency, required to house the traumatized parents after their luxurious and hollow world cracks wide open, the fun truly begins. Think the set-up's dark? Wait until the parents move in! I was so totally immersed in this novel, the characters and the setting and even the story felt so real. This is a debut by this author so I can't wait to read her next book. Damn! That book hit so close to home. It will stay with me for a long time. A dark, gripping, shocking and twisting domestic thriller and a clever piece of suburban noir. With the Cho family Yun creates a tale of cultural clashes, family secrets and smashes the American Dream. Jung Yun knows one version of Tolstoy's "unhappy" families. This one is definitely "unhappy in its own way". And her writing is clear, and basically quite simple. This book churns emotions. Continually and deeply of those which in particular surround anguish, grief, and regret. For me, it would have been a 4 star absolutely and this would be a much longer reaction, if the Part 3 NIGHT was omitted. The first parts were a vivid and dark scenario well served from 7 or 8 different perspectives, desp Jung Yun knows one version of Tolstoy's "unhappy" families. This one is definitely "unhappy in its own way". And her writing is clear, and basically quite simple. This book churns emotions. Continually and deeply of those which in particular surround anguish, grief, and regret. For me, it would have been a 4 star absolutely and this would be a much longer reaction, if the Part 3 NIGHT was omitted. The first parts were a vivid and dark scenario well served from 7 or 8 different perspectives, despite being seen through Kyung's thoughts and in majority conversations-words. But Part III was contrived, and beyond off-putting. And left the reader unsettled. Almost like knowing with certainty that there is an unseen poisonous snake somewhere in the room. That's the feeling she may have wanted to convey, but with these people drawn as they were- I felt it quite underwhelming. Not incomplete, just off. Kyung's perceptions are well drawn. As are his wife's and his parents. Kyung is one of those men who never grows up. And he knows well all the reasons. He could today and often list them from honed memory himself- while not forgetting any minutia about them for a moment. Jung Yun has written a book that contains almost no hope of recompense for violent actions of small or huge degree. And sees neglect of interest within marriage or family or for a non-communication of authentic opinion an unforgivable void to bridge. This is a sad story in the facts alone. But the sadness becomes amplified into the opposite of good intent, an almost evil self-involvement. The cultural aspects of dissimilar expectations and priorities did nothing to help the eventual resentful isolation and anger. It was more than a bad fit there, as well. The last section did not match the psychological insight for the rest of the book's copy, IMHO. All humans are not so delicate, nor are they incapable of "beginning in another way"- but this book paints a picture in which the tunnel's light has become extinguished for that route. Kyung Cho is a young biology academic, with a wife and young son. He is not a happy man. His childhood as a new immigrant from Korea in a white middle class town was not happy and his parents were severe and often cruel. To date his career has been undistinguished and he is over his head in debt with a mortgage he can't afford and is facing selling his home. His father Jin is a wealthy inventor and lives close by in a huge showcase house, immaculately decorated by his wife, Kyung's mother Mae, b Kyung Cho is a young biology academic, with a wife and young son. He is not a happy man. His childhood as a new immigrant from Korea in a white middle class town was not happy and his parents were severe and often cruel. To date his career has been undistinguished and he is over his head in debt with a mortgage he can't afford and is facing selling his home. His father Jin is a wealthy inventor and lives close by in a huge showcase house, immaculately decorated by his wife, Kyung's mother Mae, but Kyung is too proud to ask them for help after the way he was treated as a child. Kyung's mother is also very unhappy, unable to drive and go out and with poor command of English, her only social life is the Korean church. Never loved by her husband, she has always bowed to his wishes and put up with his cruelty and her only joy is in filling their house with exquisite furnishings and art work. Wow. The cover of this book quotes a review that mentions Shelter as "domestic drama at its best" & I couldn't agree more. While I knew the premise of the book before starting it, the story was still a bit darker than I was expecting. It also had a plot twist I was not expecting. Kyung, the main character, is a father drowning in debt, trying to keep his family afloat and together, and deal with unresolved feelings toward his parents, which come to light in the aftermath of an incident that Wow. The cover of this book quotes a review that mentions Shelter as "domestic drama at its best" & I couldn't agree more. While I knew the premise of the book before starting it, the story was still a bit darker than I was expecting. It also had a plot twist I was not expecting. The Vegetarian left me craving for another dark read and I could not have selected better. Shelter repeatedly surprised me as Kyung, unfulfilled and struggling to make ends meet, suddenly finds himself having to take in his parents. Parents who he’s never forgiven for his childhood. And while he was fine with ignoring things before, having never even told his wife, he can no longer pretend that the family facade is real. Profound and dark this story stayed with me as it confronted multigeneratio The Vegetarian left me craving for another dark read and I could not have selected better. Shelter repeatedly surprised me as Kyung, unfulfilled and struggling to make ends meet, suddenly finds himself having to take in his parents. Parents who he’s never forgiven for his childhood. And while he was fine with ignoring things before, having never even told his wife, he can no longer pretend that the family facade is real. Profound and dark this story stayed with me as it confronted multigenerational family issues, racism, abuse, religion… while questioning if people ever change and when is it time to stop blaming your past for your present. Geez this was a sad book. I kept waiting for something good to happen but no. I would recommend it though. People have been saying I should read this book for months and months and I'm not sure why I didn't prioritize it earlier. I guess my general impression was that it was a nice little book and I should get around to it. Someone really should have told me to run not walk to this book. And I wish I had because HOLY COW this is a book. Technically I've labeled this as a crime novel because it is in many ways about a crime and its aftermath. But mostly this is a book about the ways families keep secr People have been saying I should read this book for months and months and I'm not sure why I didn't prioritize it earlier. I guess my general impression was that it was a nice little book and I should get around to it. Someone really should have told me to run not walk to this book. And I wish I had because HOLY COW this is a book. Technically I've labeled this as a crime novel because it is in many ways about a crime and its aftermath. But mostly this is a book about the ways families keep secrets from one another, especially the deeper secrets they keep from one another when there are shameful secrets they all share. Kyung's life isn't in the best place. He's in a rut where he's checked off all the boxes, married with a child and a job, but is stifled by anxiety. But it's at least a consistent existence until it's disrupted by his parents. Kyung witnessed his father hit his mother, who in turn hit Kyung, and while he's tried hard to run away from that knowledge and those secrets, he is completely defined by them and cannot shake them off. When his parents are the victims of a terrible crime, he can no longer ignore them but instead finds himself with them under one roof again. Kyung's long buried anger and shame can't be ignored either. The tension rises slowly but surely, it's not a fun book to read, it's a book gripped with anxiety and shame, but it's absolutely addictive. Nearly five years ago, I read a Please Look After Mom – a remarkable novel by the best-selling Korean author Kyung-sook Shin. That book focused on the unfathomable sacrifices a parent makes for her children and how – at the end of the day – we are unknowable to those whom we believe know us the most. Shelter, the debut novel by Jung Yun, similarly focuses on family life but in this book, the premise is turned on its ear. The question is not “what sacrifices are made by the parent” as much as “wha Nearly five years ago, I read a Please Look After Mom – a remarkable novel by the best-selling Korean author Kyung-sook Shin. That book focused on the unfathomable sacrifices a parent makes for her children and how – at the end of the day – we are unknowable to those whom we believe know us the most. Shelter, the debut novel by Jung Yun, similarly focuses on family life but in this book, the premise is turned on its ear. The question is not “what sacrifices are made by the parent” as much as “what sacrifices are made by the adult child who never received unconditional love and emotional stability. The adult child in question is Kyung Cho, a young father and budding professor whose finances are careening out of control. His parents, Jin and Mae, have done quite well for themselves and Kyung has kept them at arm’s length from his American-born wife and son. But then, one violent day, everything changes. And Kyung must face some of life’s most quintessential issues: how can someone be whole if there’s a yawning gap in the midst of his life? What does he owe a father who has snatched away the ability to feel safe? How does he give to his own son that which was not given to himself? There is some strong writing and some harrowing scenes in Shelter. Watching Kyung unravel is almost like watching the proverbial train wreck; the reader wants to look away at times, but keeps on turning pages to see where it all leads. This reader wanted a bit more nuance; there are times that I felt the author was leading her characters as opposed to letting them lead her. Still, Jung Yun is certainly a writer with promise. 3.75. Jung Yun was born in South Korea, raised in North Dakota, and has lived in New York, Pennsylvania, Massachusetts, and most recently, Baltimore, Maryland, where she currently resides. Her short fiction has appeared in Tin House, The Best of Tin House: Stories, and The Massachusetts Review. 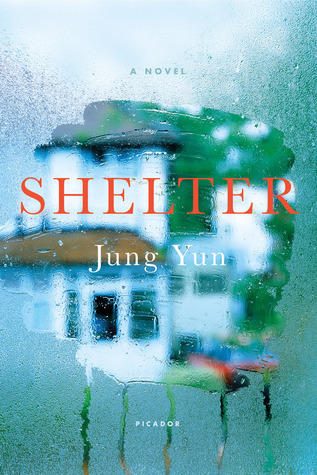 Her first novel, Shelter (Picador), was an Amazon Best Book of the Month selection in two categories (Literatu Jung Yun was born in South Korea, raised in North Dakota, and has lived in New York, Pennsylvania, Massachusetts, and most recently, Baltimore, Maryland, where she currently resides. Her short fiction has appeared in Tin House, The Best of Tin House: Stories, and The Massachusetts Review.